May i remind you that i won the first challenge? 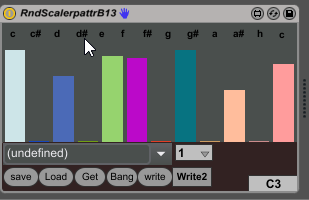 a scaler/quantizer with weighted random..
To take this to another level ...did you ever heard of the next note rule? @philoop do you know where else I kind find a description of that function? I hadf a find time finding one. I found something about it! Or is there any similar patches currently available? Looking for something that randomly generate midi signals, with controls to randomise speed, velocity etc for generative music.